This report would have been submitted to the British High Command. The troops wanted a tank designed like the MK VI. What they did not realize was that it had already been designed and a wooden mock-up built back in England. It was going to be an improved Mark V with greater speed, lighter loading and more ease of control. The most radical design feature was that the Mk VI tank had one 6-pounder gun in the front, instead of two in sponsons. All-around defense was provided by 6 Hotchkiss machine guns with 10,000 rounds of ammo among them. The Ricardo engine was moved to the side, and the crew compartment was raised, allowing for a compact crew space. What is interesting about the design is that it featured a new raised cabin that would eventually be used on the Mark VIII. There were four machine guns in ball swivel mounts: two to the front and two to the rear. 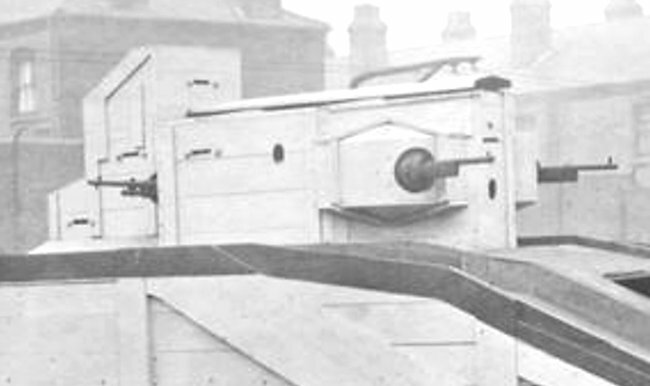 On the front of each side of the hull, two small machine gun sponsons were fitted. The tracks were to be widened to 750 mm. An order for 600 Mk VI tanks was placed, to become a part of the recently formed American tank corps. The order was canceled when the Mk.VIII was chosen instead. 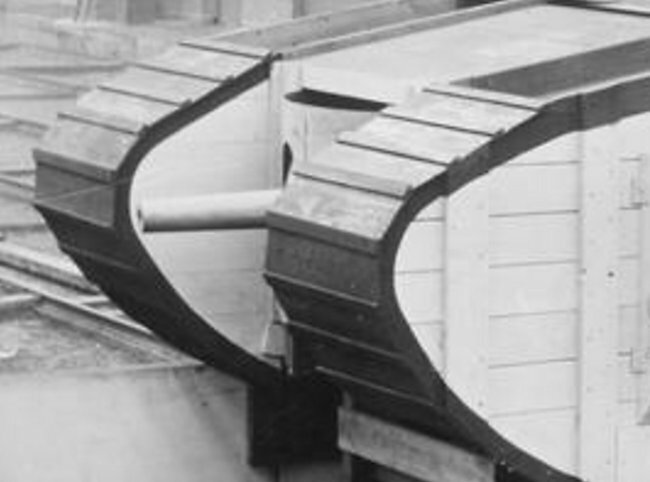 The furthest the Mk.VI got to being built was a full-scale wooden mock-up. 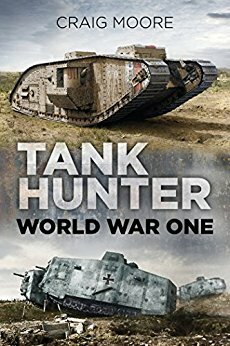 On 23rd June and 13th July 1917, it was shown to the Military and members of the War Department along with two other wooden mock-ups: the Mark V tank and the Gun Carriage Tank. The Mark V entered production but, like the Mk VI tank prototype, the Gun Carriage was not proceeded with. 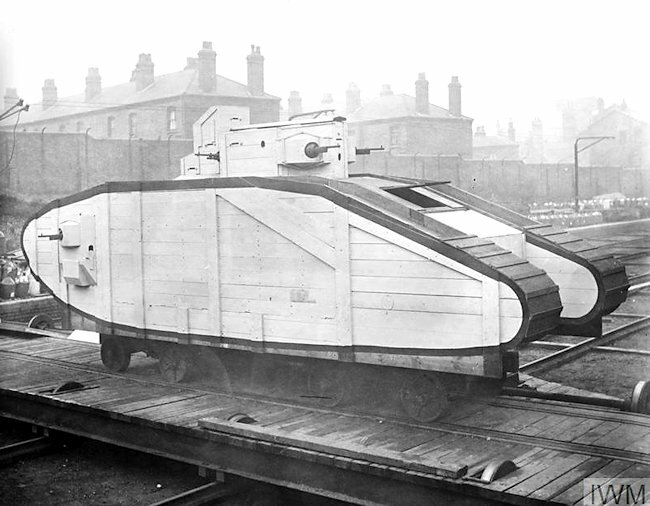 During the winter of 1916-1917, the British Army future tank design requirements were mainly in respect to an increase in armor protection and armament. As they gained more experience in the deployment of tanks on the battlefield, the calls for more technical improvements in performance became more pressing. Lt-Colonel Stern from the Ministry of Munitions was more concerned with the production of as many tanks as possible and getting them transported to France. The two main performance issues with the earlier tanks were the lack of power of the engine and how it steered. The Mk.I to Mk.IV tanks needed four people to work the driving and gear changing mechanism correctly. In the Mark V and Mark VI tanks, only one person would be needed to change gear and drive the tank. With an epicyclic gearbox, the driver alone could control the tank and the commander was freed from the duty of working the steering brakes. The proposed new Ricardo crosshead valve, water-cooled straight six 19-litre petrol engine would supply 150 hp. It was more powerful than the Foster-Daimler, 6-cylinder in-line sleeve valve 105 hp petrol engine fitted in the early tanks. This new engine was going to be used to power the Mark VI tank. The Mark VI tank was Wilson’s idea. Side sponsons caused problems when tanks were transported by rail. 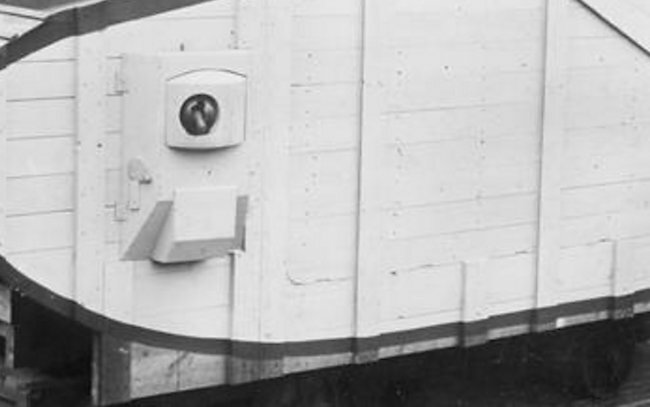 The early tanks had their sponsons unbolted for train travel. On later versions, the sponsons could be pushed inwards. His new design did away with bulky side sponsons thus making transportation to the battlefront easier. The new Mark VI tank would have a single 6-pdr gun firing straight forward between the ‘horns’ while the rest of the crew would work in an elevated structure in the middle of the tank firing machine guns. One of the reasons the Mark VI tank did not enter production was the fact that the factories would have to be ‘rejigged’ as the engine position would have to be shifted from the middle of the tank to one side. The time needed to do this work and the cost was not looked on favorably. 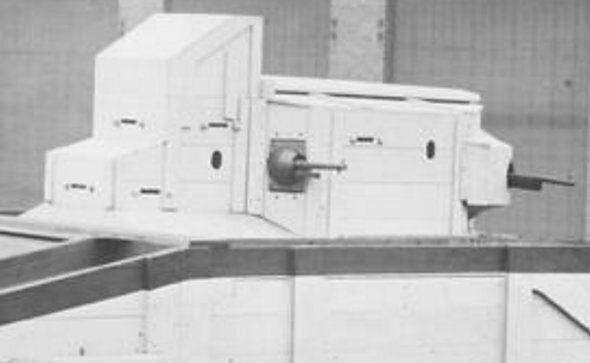 The side machine gun sponsons on both sides were smaller than those on the Mark IV tank. They were also moved a lot more forward. The angled box section at the base of the sponson had a slit at the bottom to allow spent machine gun cartridges to fall out onto the earth outside the tank. 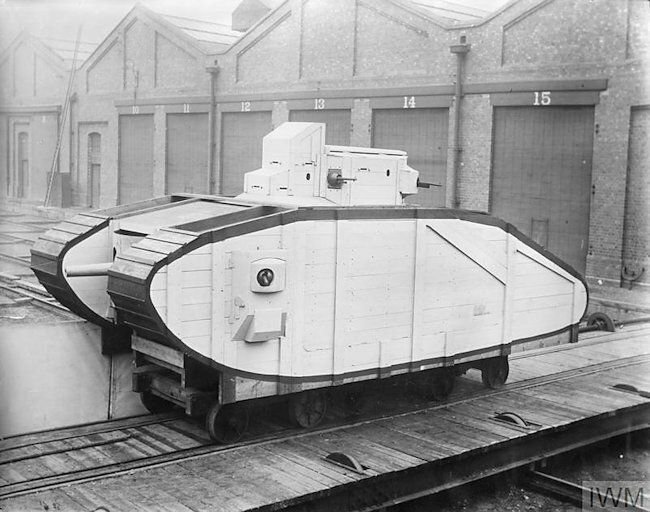 The Mark VI British tank never went into production. This is a ‘what-if’ illustration by David Bocquelet and Craig Moore. It is based on the Mark V tank chassis as both the Mk V and Mk VI wooden mock-ups were shown at the same time. If it entered production it would have seen service in 1918 and therefore be painted khaki earth brown and have the white, red and white Allied identification stripes on the nose. You can just see the barrel of the hull mounted 6pdr gun at the front of the tank. The Mark VI’s tower was a proeminent feature. It housed 4 machine-guns. There were four machine guns in ball swivel mounts: two to the front and two to the rear.